Stephanie has a background in marketing, strategic planning and communication, in both the private and NGO sectors. Before joining Oxfam GB’s Programme Policy team, she consulted on organisation development, strategic planning and governance with ActionAid International, World Bank Institute, and some grant-maker organisations. 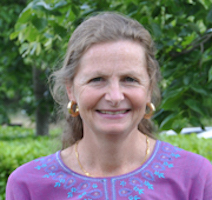 Stephanie has contributed to various transparency and accountability-related projects, working directly with Information Commissions and Civil Society groups in South Asia, as well as in the USA. In her current role, she is working with a group of advisers on essential services, gender and governance.